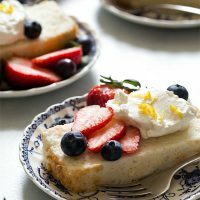 Angel Food Cake In A Loaf Pan is a delicate and fluffy white cake made from whipped egg whites and without cream of tartar. 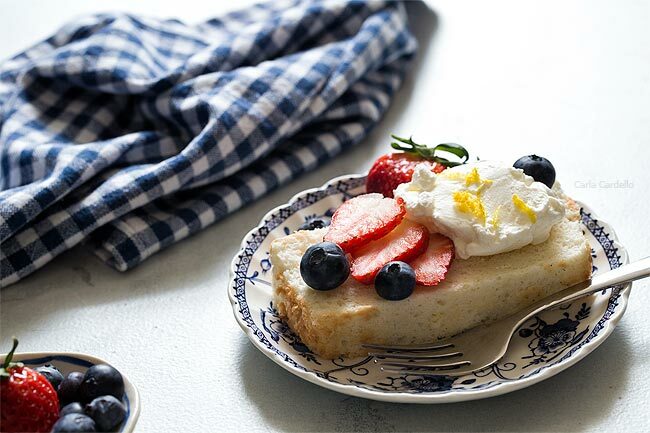 Serve it with fresh strawberries, blueberries, and whipped cream. Angel food cake is one of my favorite cakes, but I never make it because traditional angel food cake is baked in a tube pan. It’s such a one-use specialty pan I couldn’t justify keeping one in my kitchen. I did discover how to make Small Batch Angel Food Cupcakes since I do own a cupcake pan. However, with all of the small batch baking I do, I usually have a lot of leftover egg whites. Pretty soon I found myself with half a dozen egg whites in my fridge. I didn’t want to make 5-6 recipes with them; I wanted to use them all at once. Originally I was going to make small batch angel food cake in ramekins, but something prompted me to do some more loaf pan baking. 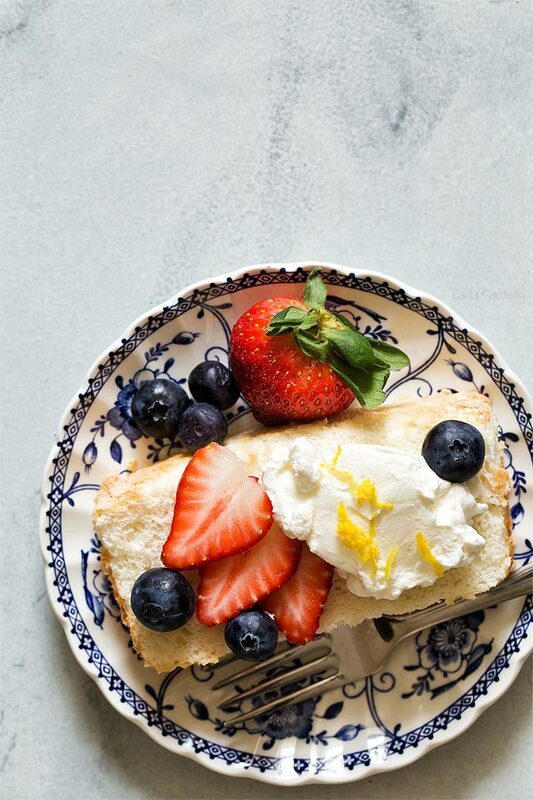 And here we are with Angel Food Cake In A Loaf Pan served with fresh strawberries, blueberries, and homemade whipped cream. You can also serve it with homemade chocolate whipped cream for a small taste of chocolate. 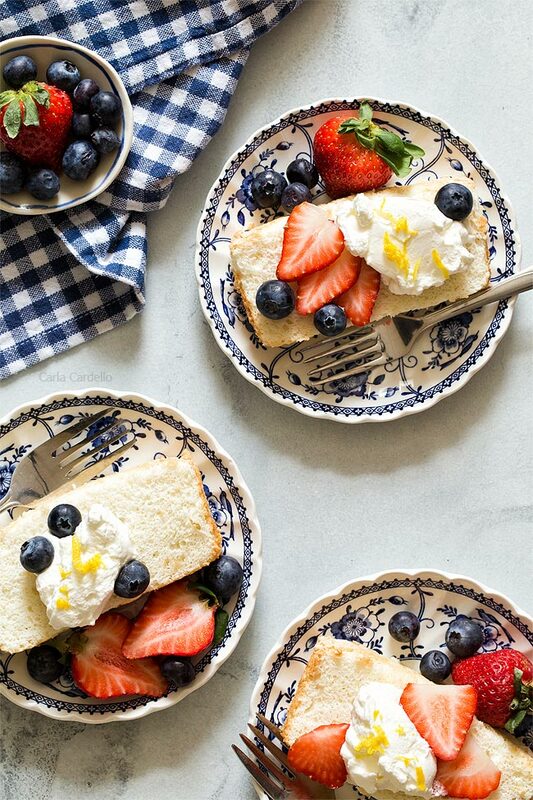 Making angel food cake involves a little bit of technique, but as long as you follow these tips, success (and cake) will be in your future. Use an ungreased 9×5 loaf pan. Instead of a tube pan, I used a standard 9×5 loaf pan. Contrary to what you’ve been taught, do not grease the pan and do not line it with parchment paper. In order for angel food cake to bake properly, you need it to stick to the pan. This ensures the cake rises and won’t fall out of the pan when cooling upside-down. Separate egg whites when they’re cold but whip them when they’re room temperature. Eggs are easiest to separate when they are cold because the yolks are firmer and less likely to break. However, egg whites are best whipped at room temperature to maximize their volume potential. So how do you separate an egg? Good news is you don’t need a fancy tool for separating. I used to own one, but the yolk kept breaking. Here’s the method I use. First, crack the egg. Let the yolk settle in one half of the shell then carefully transfer the yolk back and forth to the other half of the shell. Eventually the egg white will fall while the yolk stays in the shell. If your halves aren’t usable after cracking, you can use your hands and let the egg white fall through your fingers. It’s important to separate your egg over a different bowl than the one holding your egg whites. If you accidentally get any trace of yolk in your whites, they won’t whip properly. It’s better to ruin one egg white than to ruin the entire bowl. After separating your eggs, let the whites come to room temperature before proceeding with the recipe. Mine sit on the counter for an hour. Most angel food cake recipes call for cream of tartar, which in simplest terms is powdered acid. Acid helps stabilize the egg whites while beating into peaks because the batter is quite delicate. However, my cream of tartar was at least 5 years old, so I tossed it. And since it’s an ingredient I use maybe 1-2 times a year, I’d rather figure out a substitute I do keep on hand than waste money. It really comes down to using some form of acid rather than focusing on a specific one, so I used white distilled vinegar. You can also use fresh lemon juice. Some recipes say you can leave out the cream of tartar altogether. I don’t recommend this for angel food cake because the cake relies almost solely on egg whites. There is neither fat nor a leavening agent. Gently fold in your flour (don’t stir). Now that you whipped up some beautifully fluffy egg whites, you need to add flour without deflating them. The trick to adding flour is to fold them into the batter with a gentle hand. If you were to stir it in, you’d lose all that wonderful air you beat into the eggs. To fold in the flour mixture, add about 1/4th of it to the egg whites. Use a rubber spatula to cut the batter vertically towards you then fold part of the wet mixture over the flour. Add another part of flour then repeat. Keep doing this until all of the flour is added and is no longer dry. Any dry spots left will create air pockets or leave a weird streak in your cake. Cool your angel food cake loaf upside down before removing. It’s important to invert your angel food cake loaf while cooling to help keep its volume. If you cooled it right-side up, gravity would cause the cake to deflate. 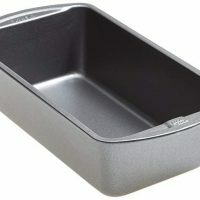 Traditional tube pans are designed to sit upside down while loaf pans are not. 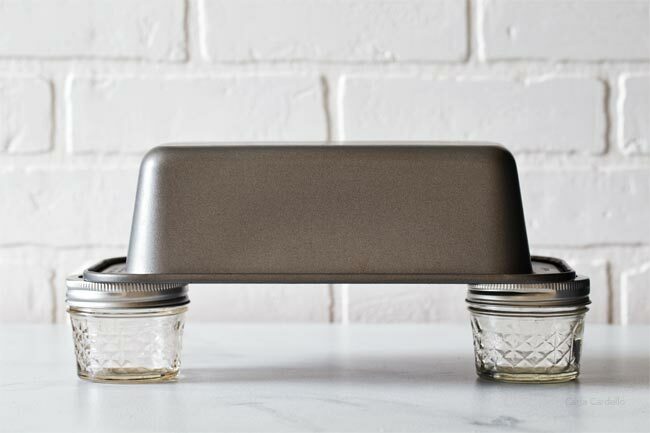 However, you can easily achieve a similar set up by resting each end of the pan (where the handles are) on top of two jars or canned items (or anything really as long as the cake is slightly elevated and upside down). 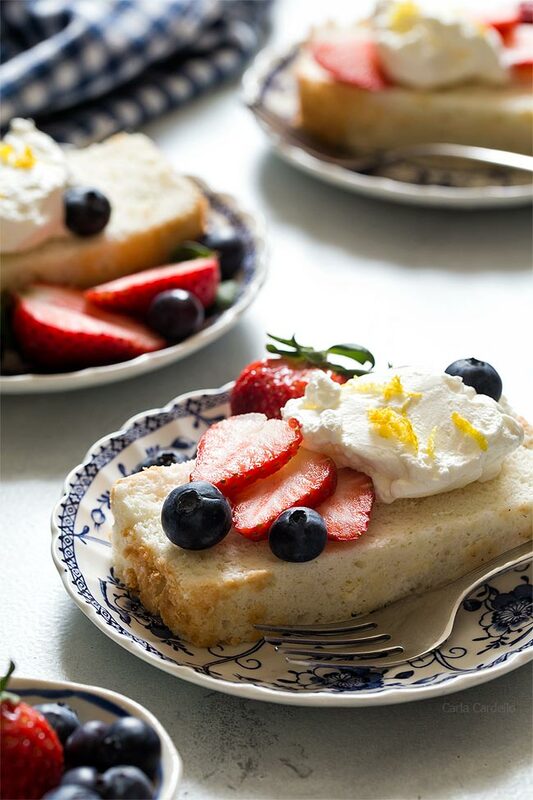 Cool your angel food cake for 1 hour before removing from the pan. Since you’re relying on the cake to stick to the pan, you can’t simply turn it upside down and have it released. Otherwise, it would fall out while it was cooling. 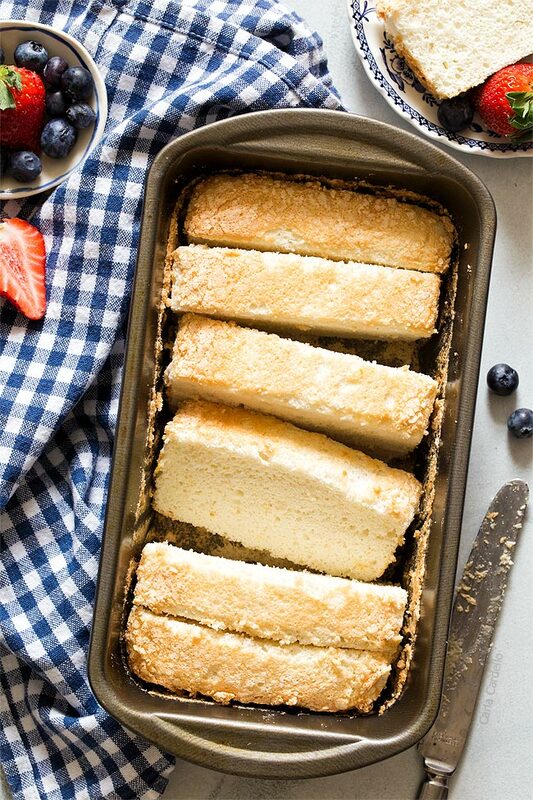 To remove angel food cake from a loaf pan, run a butter knife around the edges of the cake a few times. Next, lay the pan on one side with the cake facing you. Run your knife around the edges again and gently pull until the cake slides out. If the bottom of the cake is sticking, you may want to use an offset spatula to slide under the cake while pulling. Take your time and don’t panic. I promise the cake will slide out. How long will my angel food cake last? Angel food cake is best eaten within 2 days. After this time, the eggs will start to weep and the top will become sticky and wet. Now you have 6 yolks, what do you do with them? Good news for you – I have a list of recipes using leftover egg yolks. I don’t have any that use all 6 at once, but my German Chocolate Cake Ice Cream uses 3 egg yolks. Preheat oven to 325F. Have an ungreased 9x5 loaf pan ready. Do not line with parchment paper. You need the cake to stick to the pan. Sift together 1/4 cup sugar, flour, and cornstarch. In a clean bowl (with no trace of fat) of a stand mixer with the whisk attachment (or with a hand mixer), beat on medium speed the egg whites, vinegar, vanilla, and salt until foamy, about 30 seconds. Increase the speed to high. Gradually beat in the remaining 1/2 cup sugar, 1 tablespoon at a time, while the mixer runs. Beat until soft peaks form (when you pull the beater up, peaks will form but fall over), about 3-4 minutes. Do not beat into stiff peaks. Using a rubber spatula, gently fold in the flour ingredient, 1/4 at a time, into the egg whites. You want to incorporate all of the flour without deflating the egg whites, so take your time. Make sure there is no dry flour left. Transfer the batter to the loaf pan and evenly spread. Bake 35-40 minutes or until brown and no longer sticky on top. Turn the pan upside down and rest the handles on top of two jars, canned goods, similar set up. Let cool upside down for 1 hour. Do not skip this step. The cake will deflate if cooled right-side up. Once ready to serve, carefully run a butter knife around the edges. Lay the pan on its side then carefully pull the cake out with your knife. If you're having trouble, you can use an offset spatula and run it under the bottom of the cake so it doesn't stick anymore. 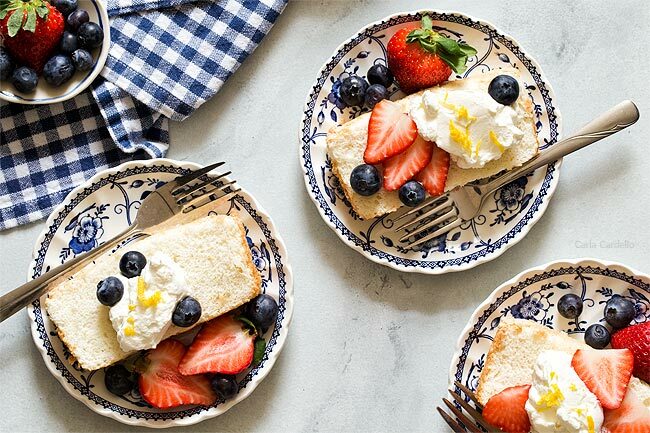 Serve with fresh strawberries, blueberries, and whipped cream. Store in an airtight container for up to 2 days. *Eggs are easiest to separate when they are cold because the yolks are firmer and less likely to break. However, egg whites are best whipped at room temperature to maximize their volume potential. If there is any yolk in the egg white, you need to start over. Don't know what to do with the extra egg yolks? Check out my recipes using leftover egg yolks. Used your upside down cooling hack and it helped. What a great advice! Your tips were absolutely essential, and wow did they result in an amazing angel food loaf! I’ve never had one turn out so successfully, so this will definitely be my go-to from now on! Awesome! Thank you for sharing your positive experience.